Eleven top Chinese pharmaceutical, medical and healthcare professionals were honored in Beijing last month with the 13th Wu Jieping-Paul Janssen Medical & Pharmaceutical Award for their leadership and innovation. The award supports exemplary efforts by practitioners who work to improve the quality of patient healthcare through innovation and is consistent with China's ambition of establishing a national innovation system by 2020 in which talent development is a critical aspect of the overall plan. "The Wu-Jan Award honors professionals whose innovative work improves the health and quality of life of the Chinese people. Xian Janssen is delighted to support this award. We are committed to caring for patients and constantly striving to improve China's public health," said Thad Huston, president of sponsor Xian Janssen. In addition to its own expansion in research and development in Shanghai and Beijing, Xian Janssen has also worked with Tsinghua University's School of Medicine for the prevention and treatment of infectious disease. The company also supports talent programs for the university. The best way to cultivate innovation at top academic institutions in China is to cultivate talent, said Professor Shi Yigong, who is also the dean of the School of Life Sciences at Tsinghua University. Xian Janssen has invested $4 million over five years in the school to recruit top talent from home and abroad. Other multinational pharma companies are also investing in cooperation with Chinese universities and medical institutions to conduct R&D work, especially on early-stage research, given the specialties of the local partners' research teams and laboratory facilities. Bayer HealthCare Co has been cooperating with Tsinghua University over innovative drug discovery since 2009. The joint projects focus on different research aspects starting from early research programs to gain deeper understanding of disease mechanisms, identification of new drug targets and spanning further to joint structural biology research and medicinal chemistry programs. "A new focus of our collaboration will be the area of structural biology, where scientists from Tsinghua University will work in close collaboration with Bayer scientists to solve the 3D protein structure of biological molecular targets as a basis for new drug discovery projects," said a spokesman. At the end of 2011, Merck Sharp & Dohme revealed its plan to invest $1.5 billion in R&D in China over five years. In addition to building its Asia R&D headquarters in Beijing, some of the money is earmarked for collaboration with local universities and medical institutions, . 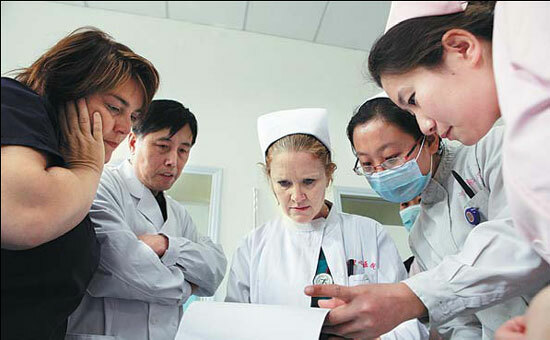 "The decision to locate the facility in the capital city was made to bring the company closer to national-level and first-class research bodies and universities - such as Peking University, Tsinghua University and Beijing Institute of Life Science (a division of the Chinese Academy of Sciences)," Kim said, adding that the company also hopes to attract high-quality young talent to the universities via the partnership.